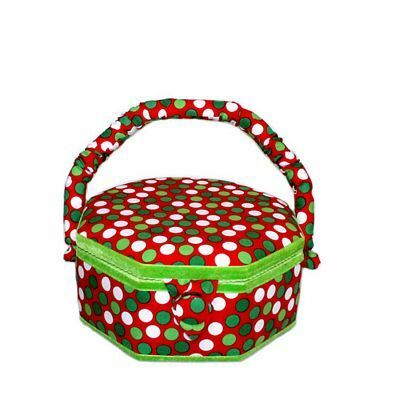 What better way to keep all your sewing supplies together than with this colorful sewing basket featuring christmas colored polka dots! The fabric featured on this basket is the Christmas Polka Dot fabric printed by Robert Kaufman Prints. 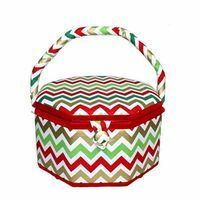 Along with a sturdy handle and magnetic snap closure this youthful basket contains a pin cushion, a pocket in the lid and a lift out organizing tray. This sewing basket measures 7 1/2" long by 7 1/2" wide by 3" deep.